This is a key component in my Purple Cow thinking, but with a twist. 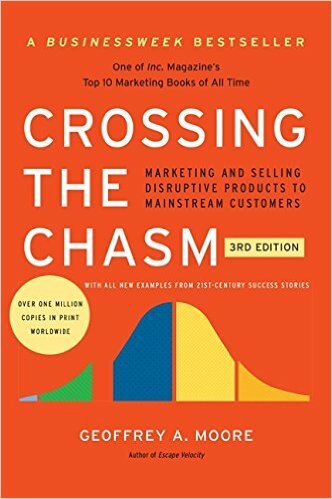 I'm not as worried about the chasm as I am about the desire of marketers to go for the big middle. Very valuable for every entrepreneur. What others thought about "Crossing The Chasm"
In Crossing the Chasm, Geoffrey A. Moore shows that in the Technology Adoption Life Cycle--which begins with innovators and moves to early adopters, early majority, late majority, and laggards--there is a vast chasm between the early adopters and the early majority. While early adopters are willing to sacrifice for the advantage of being first, the early majority waits until they know that the technology actually offers improvements in productivity. The challenge for innovators and marketers is to narrow this chasm and ultimately accelerate adoption across every segment.